If you are a parent (or aunt, uncle, grandparent, teacher, volunteer or friend), chances are you worry about how the media, diet ads, and our culture in general might affect your child’s health and well-being. I’m here to tell you that you have the power to raise resilient children who will resist diet culture. You see, so many of us were raised in homes with parents who policed our food, moms who dieted off and on, and the idea the being thin was the goal at all costs. You may have started hating your own body when you were 10 or 12 and it’s been a battle ever since. Now, you know you want to do better with your own children, but you have no idea how to break the cycle. The good news is: You have the power to influence your children. Your words and actions can help you raise children who shun diets and respect their body. Media and social media images portray an ideal body type that is not achievable by many, leading to negative body image and diet behaviors. Dieting is the most important predictor of developing an eating disorder. But what should we, as adults do? You Can Help Influence Kids’ Ability to Resist Diet Culture. If you have children in your life, you’re probably concerned. You want them to be healthy AND have a better relationship with food than you were raised to have, but you’re not sure where to begin. I want you to know that you do have an impact on the kids in your life and you can strongly influence them. You might not think it, but our children really do listen to what we say (and do). Continually try new diets to help you lose those stubborn 20 pounds…. I know that changing the way you talk and behave can be REALLY HARD. Most often, when a group of women get together, the subject of bodies and dieting comes up. So, here’s where I’d like you to start: when you notice the urge to bash your body while you’re on the phone, bite your tongue! And when you are at the pool, bottle up all that insecurity you feel and get in the pool. Your child will love having you swimming with them! Don’t let your daughter believe that she can’t swim when she’s an adult! Perhaps you’ve made the effort to change your language. You don’t use the words fat, chubby, and thin anymore. But, you may have started using words like fit, healthy, and strong. While there is nothing wrong with these words per se, they may get twisted around in your children’s heads. You see, in our society, the words healthy and fit often translate to thin. I can already hear the objections I’ll get, but let me elaborate: Research show us that children ultimately want to eat food that they enjoy and makes them feel good. Yes, there are medical and psychological exceptions and those might need some intervention, BUT it is highly unlikely that your child falls into this group. The parents’ job is to provide the structure of varied meals and snacks, including treats, at set times. However, parents should not bribe or otherwise meddle into what their kids eat at the table. You decide on what, when and where. Your child decides how much and whether or not they eat. That’s it! If they decide not to eat, they’ll eat at the next meal or snack. 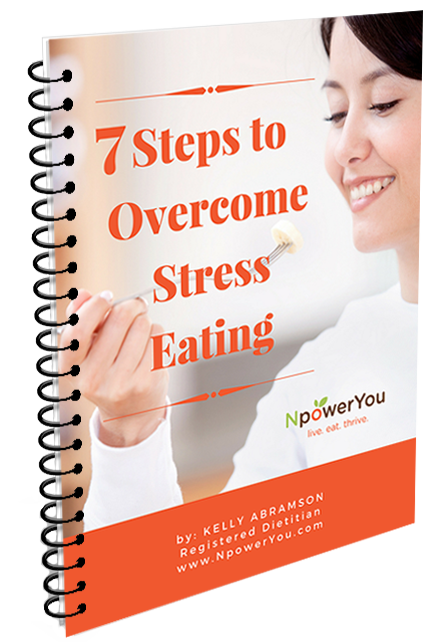 They won’t starve or be scarred by not eating at one meal – trust me! Sadly, doctors don’t always know best. 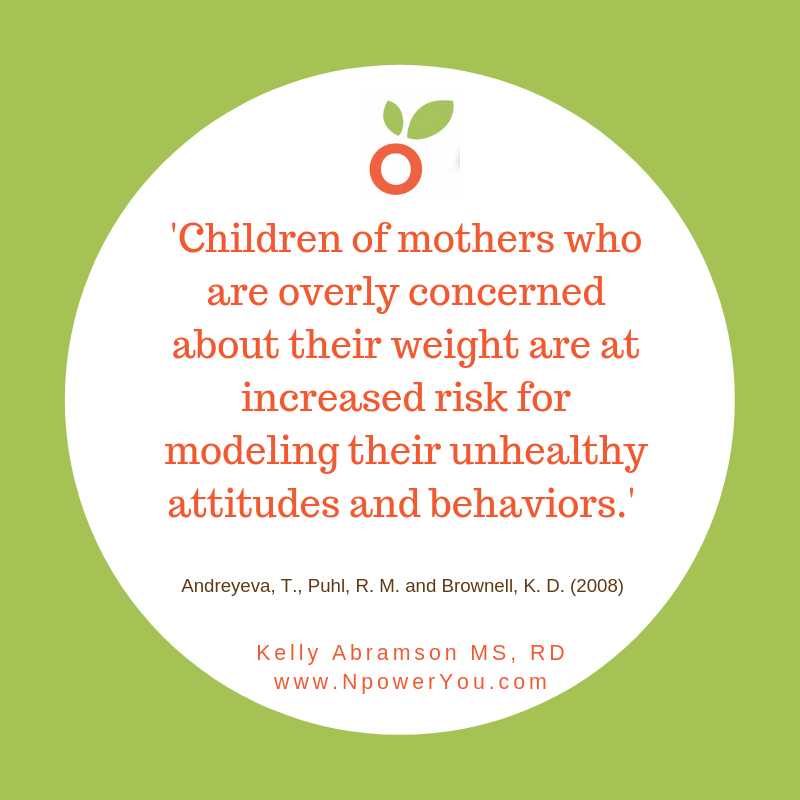 Many have many of the same weight biases that are so prevalent in our society. Be your child’s voice when other (well-meaning) authorities discuss counting calories, your child’s weight or their body size. Doctors should not expect children to grow in a linear fashion, nor discussing BMI with your children at annual physicals. It’s amazing, but most children grown predictably when given structure and autonomy around food and exercise. Occasionally, a child may deviate from their growth curve. If this persists, a family consult with a non-diet registered dietitian to help with structure might be in order. Sit down and eat family meals with your children. Family meal doesn’t have to mean dinner. Any meal counts. Family meals don’t mean you have to cook something elaborate. Sandwiches, a meal kit or take-out count too. As long as everyone is sitting at the table without electronics at the same time, it’s a family meal! However, parents should eat the same food as their kids. Too many moms let their food issues prevent them from sitting down and eating the same food as their families. You might read the above list and find some suggestions challenging. I want you to know that every action you take will have positive effects on your children. I also want you to know that picking and choosing the steps that are easy for you WILL leave your children more vulnerable. I know that so many women have lots of body image and food baggage that they’ve been carrying around for most of their lives, and moving through that all is hard work. I do believe that you can make these changes for the benefit of your children. When it comes down to it, is there anything you wouldn’t do for your kids?